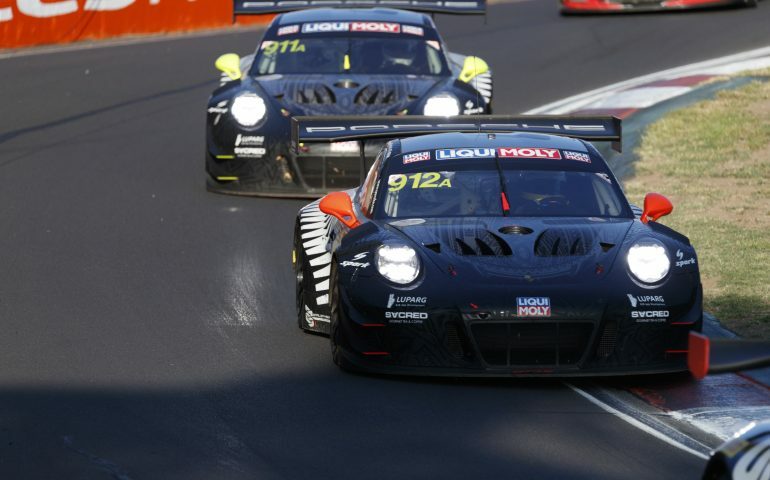 Matt Campbell, at the wheel of the #912 Earl Bamber Motorsport Porsche 911 GT3-R he shared with Dirk Werner and Dennis Olsen, took the chequered flag 3.4 seconds ahead of Jake Dennis in the #62 R-Motorsport Aston Martin V12 Vantage to win the 2019 Liqui-Moly Bathurst 12 Hour. 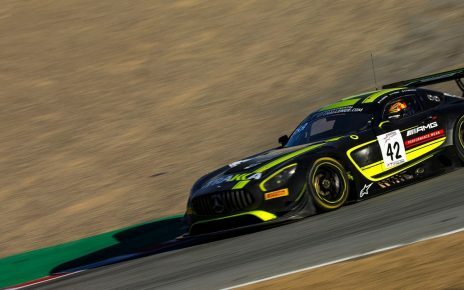 Completing the podium positions was the #999 Mercedes-AMG Team MANN FILTER GruppeM Racing Mercedes-AMG GT GT3 with Raffaele Marciello at the wheel in the car he shared with Maxi Buhk and Maxi Götz. Taking the win in the Class B category was the #4 Grove Entry Porsche 911 GT3 Cup, piloted by Stephen and Brenton Grove and, taking the chequered flag, Ben Barker. The battle for the Class C win was close with the #48 KTM / M Motorsport X-BOW GT4 piloted by Justin McMillan, Glen Wood, Dean Little and Peter Major crossing the line one lap ahead of the #13 RHC-Jorgensen/Strom by MarcGT X-BOW GT4. At the end of the Bathurst 12 Hour only one car remained in the Invitational class field and the win went to the #20 T2 Racing by Liajen Motorsport Marc II V8 driven by Adam Hargraves, Daniel Jilesen and Steve Owen. 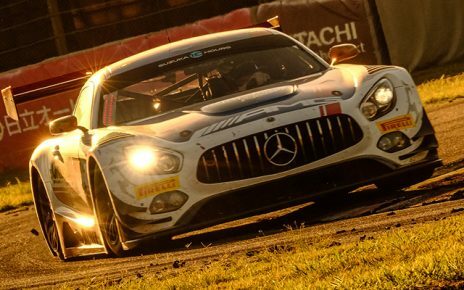 Mercedes-AMG controlled the opening two hours of the race with Maxi Buhk, in the 999 Mercedes holding the lead from pole position with Luca Stolz in second, the pair holding off Steven Kane, at the wheel of the #107 Bentley Team M-Sport Continental GT3. Stolz took the lead after the first round of pit stops but the Safety Car was deployed shortly after the stops when David Calvert-Jones, driving the #12 Competition Motorsports / McElrea Racing Porsche, went off at Sulman Park. When racing resumed, Kane was able to put pressure on Buhk until the Safety Car was deployed again due to contact between the #27 HubAuto Corsa Ferrari F488 GT3 and the #96 Marc Cars Marc I.
Kane passed Stolz for third just as the Safety Car was deployed again, this time for the #760 R-Motorsport Aston Martin V12 Vantage, driven by Andreas Baenziger, which had spun exiting The Chase. As the race approached the four-hour mark, Augusto Farfus took the lead at the wheel of the #42 BMW Team Schnitzer M6 GT3, ahead of Maxime Soulet in the #108 Bentley. The race saw its fifth Safety Car after Danny Stutterd in the #43 Ashley Seward Motorsport Porsche 911 GT3 Cup car went off at Sulman Park and at the restart it was Augusto Farfus in the #42 BMW who led, with Maxime Soulet putting pressure on Brazilian driver after Soulet had passed Maxi Buhk for second. Moving into the second half of the race, Vincent Abril, now behind the wheel of the #108 Bentley led with the sister #107, with Stephen Kane driving, in second and Martin Tomczyk in the #42 BMW in third. The Safety Car was called on to make another appearance after the #91 Marc Cars entry stopped out on the circuit, allowing many of the front runners to call into the pits, with the resultant shuffling of the pack. Matthieu Vaxivière, now behind the wheel of the #62 R-Motorsport Aston Martin V12 Vantage, held on to the lead at the restart. The Safety Car was called out again to recover the #77 Mercedes-AMG Team Craft Bamboo Black Falcon which had stopped at Forrest’s Elbow with Gary Paffett at the wheel. When race the race restarted, the #911 and #912 Porsches were leading the field. As the race passed the eight-hour mark, it was Alexandre Imperatori, behind the wheel of the KCMG Nissan GT-R NISMO GT3 who held the lead, which he held until Lap 220, Marvin Kirchöfer moving to the front when the Nissan pitted. With the Liqui-Moly Bathurst 12 Hour moving to a conclusion Matt Campbell took over the #912 Earl Bamber Porsche, allowing Jake Dennis in the #62 R-Motorsport entry to take the lead, followed by 2018 Blancpain GT Series Champion Raffaele Marciello in the #999 Mercedes in third. However the Safety Car was to come in to play again, this time with thirty minutes remaining, due to the #50 KTM / M Motorsport X-BOW stopping on the circuit at Conrod Straight. At the restart, Dennis in the #62 Aston Martin held the lead, followed by Marciello in the #999 car and Campbell in the #912. Campbell passed Marciello at Hell’s Corner and, with less than ten minutes remaining, passed Dennis in the #62 car at Forrest Elbow to take the lead which he held to the chequered flag. Victory at Bathurst was a first for Porsche at Mount Panorama and in the Intercontinental GT Cup for the Stuttgart manufacturer. 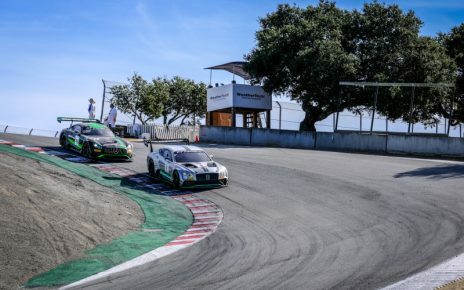 The 2019 Intercontinental GT Cup now moves to the US for the Laguna Seca Raceway California 8 Hours on March 28 – 30.